The most advanced handpan we have ever created. 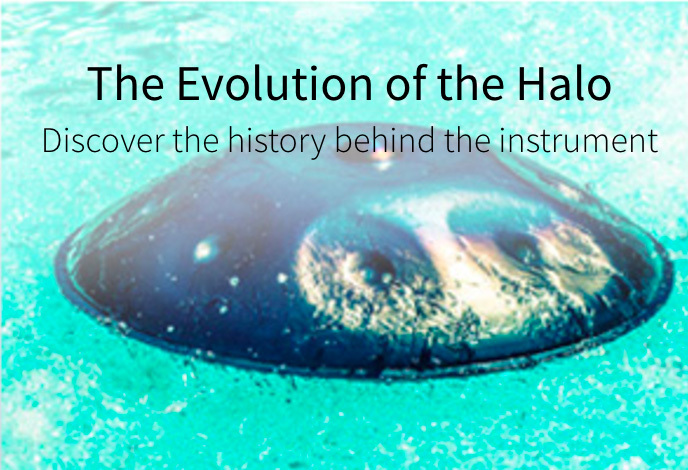 Perhaps more than any other Halo we’ve designed, the New Era Halo is a clear example of how sound, design and engineering become one through the handpan. Introduced in 2017, New Era Halos are created through a synthesis of the hydroforming process pioneered by Colin Foulke, and the advanced interstitial Rolling Method designed, built, and now evolved by Pantheon Steel. The use of water pressure to form handpan shells moved from notion to industrial process through the work of master player and maker Colin Foulke. A long-time friend (and customer) of Pantheon Steel, Colin showed Kyle his hydroforming process in its very early days. Intrigued by its possibilities, Kyle asked Colin for his blessing to explore its possibilities, and he was happy to give it. In further testament to his generosity and commitment to helping grow the handpan world, Colin went on to share his process with the world in 2016. This inspiring gesture opened the door for handpan makers worldwide to form their own consistent, and reliable instrument shells with relative ease. On the surface, the New Era Halo appears to be quite a departure from the instrument’s original nature. In some ways it is, for the instrument has a revised foundation. But make no mistake, the new Halo still benefits from processes unique to Pantheon Steel’s fabrication techniques, and it is still very much a Halo. Hydroforming is only the first step in crafting a new era Halo. Every instrument is worked into final form with an advanced new version of our patented Rolling Method, something made possible by the most sophisticated technological achievement to date for Pantheon Steel. “In 2010, I shared an idea with Jim [Dusin]: my vision of a robot which could consistently replicate the pneumatic hammering we do on the interstitial areas between tone fields. I had already evolved the note shaping process to be procedural, rather than intuitive, in pursuit of consistency, but we remained naturally limited by the human inability to ever do things exactly the same way every time. Though the process strived for the highest achievable consistently, I could not live up to my own expectations. What I longed for was the ability to reliably and consistently create a Halo shell that was pre-shaped, loosened, and ready for tuning. If our processes could provide that, my energy, focus, and attention could be fully given to freeing the voice of each instrument; I would not spend hours fighting, and working around, inconsistencies introduced early on. What I envisioned was an automated process that would be the first step towards making this reality. A sorcerer’s apprentice which could do what I did, as well as I did–and possibly better. Much like Jim had successfully built a machine to perform the hammered shell sinking process, we now sought to create one to achieve the very different process of note shaping. For the next three years, the design for this next generation machine lived on a computer screen. During that time it went through many iterations, but when at last its design was approved, fabrication began. By the fall of 2013, our machine was fully built–but only the skeleton and muscle. To live, it needed a nervous system and brain. The process of educating and controlling the machine–its programming–was the task of the laser-focused genius of Lino Schraudolph. When Lino arrived, the fun began. As with any baby, its first step was a small one. By the time he left to go back to Germany a few weeks later, the machine was alive – but only able to do a few basic functions. Over subsequent visits, and over several iterations of its mechanical specifics, Lino coaxed the new machine into the process of note shaping. It is now a full time contributor to the note shaping process of every new era Halo. Its tireless labor is what makes our satellite locations around the world a reality. Our tuners are now given the best possible, and most consistent, platform for tuning available anywhere.